Spare a thought for the CEO of Yahoo, Marissa Mayer. Nearly four years on the job, the ailing internet giant is still struggling to deliver a credible path to growth. And following the US$4.3 billion loss the company reported for the year in its latest results, the Yahoo board undercut her plan to “accelerate Yahoo’s transformation” with its intent to “engage on qualified strategic proposals” – widely interpreted as putting the company up for sale. Mayer’s plan involves laying off 15% of the company’s workforce in an effort to streamline the business. Yahoo is also planning to sell real estate and intellectual property. However, investors are clearly unhappy with Yahoo’s performance – some interpret the focus on cost cutting and profit raising as the latest sign the company is planning to offload its core business. A major reason for this is that by some measures – if you subtract the value of Yahoo’s major assets from the market value of the company, which includes a hefty stake in Chinese e-commerce behemoth Alibaba, for example – Yahoo’s core internet business is worth less than zero. How Yahoo manages its investments is therefore crucial and unlocking their value is a challenge. Selling its stake in Alibaba is easier said than done. Selling the stake and paying out the proceeds to shareholders would lead to a big tax bill. One way to lower this liability, however, could be in holding the Alibaba investment under the existing company and spinning off its core Yahoo business into a new listed company. This has the obvious advantage of keeping the current management in-situ – but it is premised on market confidence in the existing management team. Once a major player, Yahoo has become increasingly irrelevant, despite huge investments in engineering and media talent. Instead of cashing out when it had a US$45 billion offer from Microsoft in 2008, Yahoo has spent cash acquiring other companies and investing in new equipment in the vain hope that it can compete successfully with today’s major players, Google and Facebook. This has largely been led by Mayer who was hired from Google in 2012 to turn the company around. The reporting of significant “goodwill impairment charges” was essentially a write-down of the value of previous acquisitions, reflecting recognition that they have not paid off. Investor awareness of this suggests that a private buyer might be welcome to take over Yahoo’s assets, optimise tax liabilities and eliminate expenditures that seek to compete in arenas where the probabilities of success are exceedingly low – this is how some have interpreted Mayer’s strategy. Buyers are more likely to have a lower tolerance for re-imagination and a far more singular focus on maximising cash flows from Yahoo’s existing product line – hence the board’s emphasis on seeking out “strategic alternatives”. 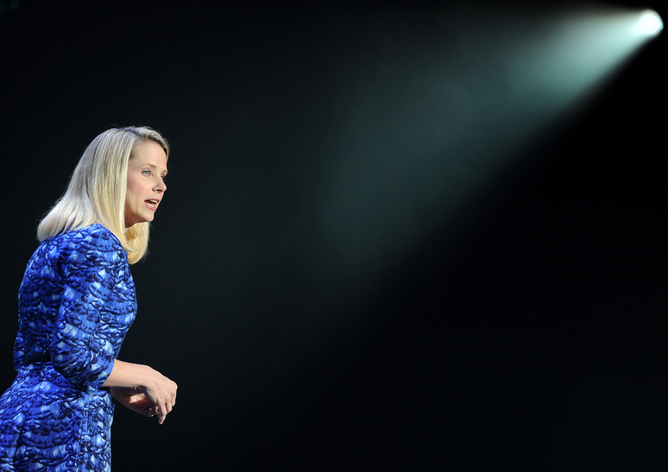 In the meantime, Mayer will be hoping her attempts to engineer a turnaround at Yahoo materialise. In a deft presentation, she sought to break revenues into two parts – the declining revenues from the existing business and the potentially exponential growth that will result from newer product lines. Her analysis warned of decreased revenues in 2016 with the prospect of higher revenues in the future. Missing from this, however, was any detail of the profitability of these newer businesses. Ultimately, investors care about results and these were – to say the least – disappointing, and followed swift on the heels of rival Google’s bumper earnings report. At best, Yahoo’s profit margins were 2% in the fourth quarter of 2015 compared to Google’s 31.9%. Similarly, free cash flow was essentially zero in the second half of 2015. It is difficult to see Yahoo surviving in its current form with its current management. The earnings announcement was an opportunity for a far more candid account of its problems and how they could be addressed. Rather, listeners were told that things would get better in a year’s time, based on an arbitrary classification of old and new products. The gap between Yahoo’s market value and the value of its investments reflects investor scepticism. At such a time, phrases like “propel execution to a new level”, “re-imagining search” and “intense legacy drag” are unlikely to restore confidence. If anything, Mayer’s reassurances will only serve to propel investor scepticism to a new level, which further drives speculation that they are open to buyers.